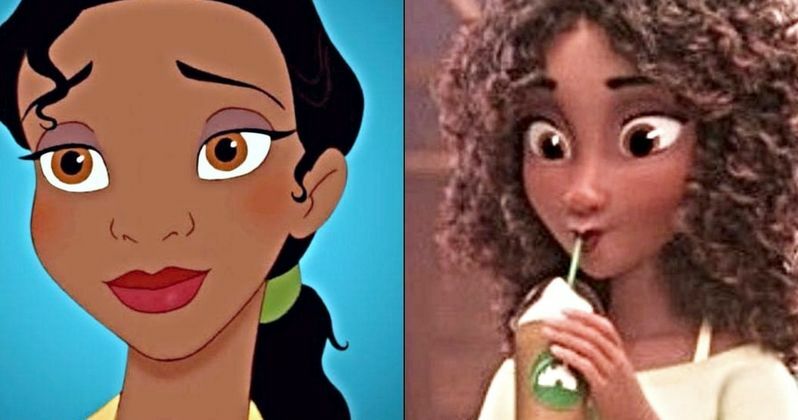 Ralph Breaks the Internet: Wreck-It Ralph 2 has come under fire for making the skin tone on Princess Tiana lighter and giving her a smaller nose from the original animated version in The Princess and the Frog. Fans noticed right away that Tiana did not look the same and started criticizing the studio on social media. It had been rumored that Disney was going back to fix the problem after the complaints started to roll in, and voice actress Anika Noni Rose has confirmed that the studio is in the process of reanimating her Princess Tiana character to get her back to normal. Anika Noni Rose posted a lengthy message on social media to announce that she was working with Disney to fix the problem, which is featured in the popular Disney Princesses scene from Wreck-It Ralph 2. The studio agreed to redraw Princess Tiana after lightening her skin and changing her facial features. While the backlash was in its infancy, Rose kept silent on the matter, but she has now decided to break that silence. She had this to say. "My team and I immediately put in a call to the studio to talk about the visual changes, and three weeks ago I had a meeting in person with the Wreck-It Ralph team, my original animator Mark Henn, and others... I was able to express how important it is to little girls (and let's face it, grown women) who felt represented by her that her skin tone stay as rich as it had been, and that her nose continue to be the little round nose that Mark so beautifully rendered in the movie. The same nose on my very own face and on many other little brown faces around the world, that we so rarely get to see in fantasy." Disney animators told Anika Noni Rose that the CGI animation "did different things to the characters' color tones" because of the different lighting compared to the hand drawn style of animation. Rose was happy that Disney was willing to go back and work on her Princess Tiana character so late into the process. Wreck-It Ralph 2 hits theaters on November 21st, so the clock was definitely ticking to get the changes made in time. It isn't clear if Disney had already started making merchandise to promote Wreck-It Ralph 2, but if they started getting the Disney Princesses stuff ready, they're going to have to go back and fix that as well. However, there's still plenty of time, and if anybody has the money to go back and make such changes, it's Disney. The studio worked with Anika Noni Rose to swiftly go back and make her desired changes to her character, so working on merchandise shouldn't be too big of a hurdle. Wreck-It Ralph 2's Disney Princess scene was what Disney used to first unveil the animated movie during last summer's D23 Expo, with nearly all of the surviving princesses on stage together. Throughout the marketing campaign, the Disney Princesses have been a big focal point, so it was wise of the studio to go in and reanimate Princess Tiana so quickly, before the backlash got even more out of control. You can read the confirmation of Disney's decision to reanimate Princess Tiana below, thanks to Anika Noni Rose's Instagram account.